Tay Garnett’s The Postman Always Rings Twice, based on the 1934 novel by James M. Cain, opens on a lonely stretch of highway outside of Los Angeles, with a shot of a sign hanging outside a gas station that says “Man Wanted.” We’ll soon learn that the sign has a double meaning. Itinerant drifter Frank Chambers (John Garfield) is hitchhiking from San Francisco, and has thumbed a ride with a nattily dressed man (Leon Ames) whom we’ll soon learn is the local district attorney. Nick Smith (Cecil Kellaway), the owner of the gas station/lunch counter, runs out and greets Frank, assuming he has come about the job. It isn’t long before Frank meets Nick’s wife, Cora, (Lana Turner), in one of the best introductions of a sexpot in ’40s cinema. As he’s eating at Nick’s lunch counter, a tube of lipstick rolls across the floor, the camera focuses on it, then pans back along the floor until it comes to rest on Turner’s legs. Cut to Garfield, his breath quickening, then to a full shot of Turner, in a skimpy white two-piece playsuit that would still turn heads today (although her turban might stand out as being a little odd). As soon as Cora appears, we know Frank will take the job working for Nick just to be close to her. In the book, Nick is a Greek, and described in detail as a physically repulsive character. In the film, he’s just a harmless old fuddy-duddy. Things play out the same, however. Cora leaves a “Dear Nick” letter and she and Frank run off together, but life on the open road, hitchhiking with a delighted-looking Frank, who has two suitcases under his arm, doesn’t agree with Cora or her white blouse, or her white peekaboo toe pumps. So they return before Nick comes home and finds the note, and pick up again with their unhappy triangle. One murder attempt designed to look like an accident goes wrong, and after Nick announces that he is selling the business and taking Cora with him, Frank and Cora devise a simpler plan to just get Nick drunk and push him off a cliff in his car. 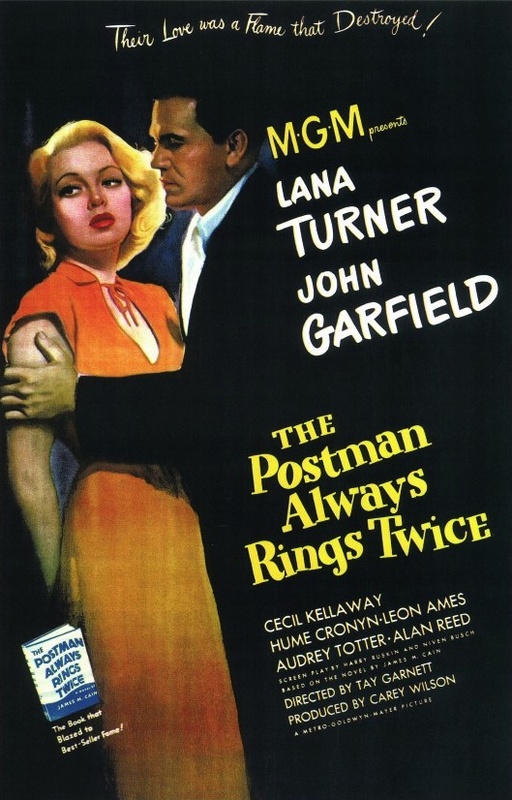 Technically The Postman Always Rings Twice is a film noir, but it occasionally borders on farce, especially after the murder, and is filmed in a professional and well-lighted but ultimately flat style. Too much of the film’s running time is taken up by courtroom machinations and the gamesmanship between Arthur Keats (Hume Cronyn), Frank and Cora’s lawyer, and district attorney Kyle Sackett (Ames). It’s all well-done and entertaining, but in a light and breezy way. There’s the threat of execution in the gas chamber for our two protagonists, but there’s no sense of impending doom during the courtroom proceedings, and with the focus on Ames and Cronyn, it borders on comedy. Things pick up in the noir department towards the end of the picture, but it takes too long to get there, and is undercut by a ridiculous, moralizing denouement. In some editions, Cain’s novel is barely more than 100 pages long, but this film is bloated and overlong at 113 minutes. More minutes in the film than there are pages in the original novel? There oughta be a law. 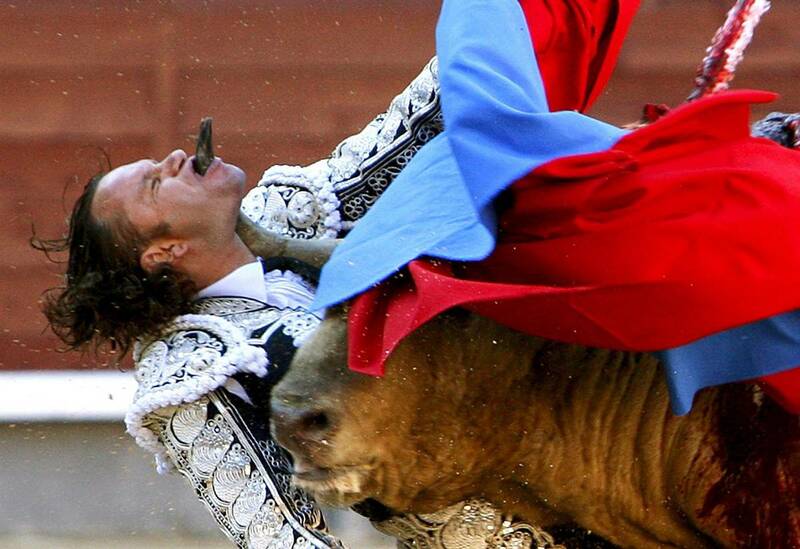 MGM wasn’t known for this kind of picture. In general, they didn’t even do crime pictures or thrillers. After the runaway success of Billy Wilder’s Double Indemnity in 1944, however, every big studio released at least one similar picture in an attempt to cash in on the craze, with all the attendant love triangles, murders, and doomed protagonists. What better choice for MGM than another novel by Cain? Especially the one most similar in its basic plot? Cain’s 1941 novel Mildred Pierce had already been done, and with a murder plot that was never in the novel, which was more of a straight kitchen sink drama. His 1937 novel Serenade was too weird. 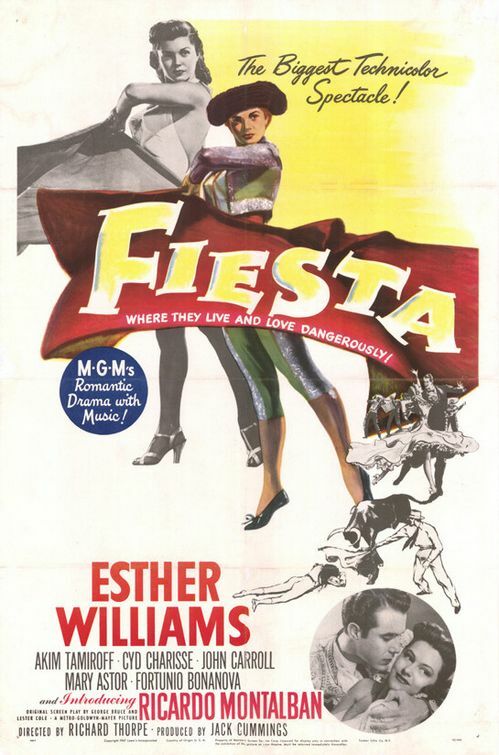 It featured a love triangle, but between a spicy Mexican prostitute, her opera-singing boyfriend who loses his voice when he’s tempted by homosexual desires, and the orchestra conductor whose magnetism threatens to draw him into a gay tryst. 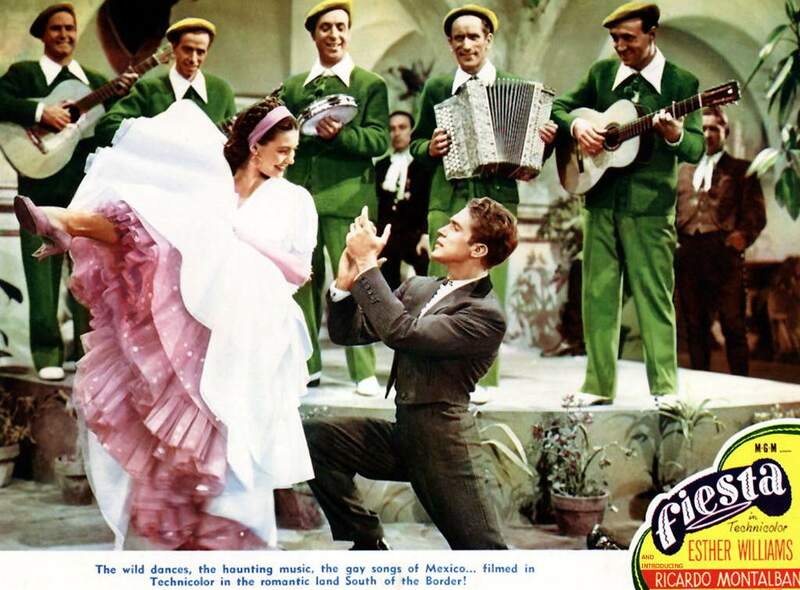 (Eventually Serenade was made into a film in 1956 starring tenor Mario Lanza and directed by Anthony Mann, but the gay theme was jettisoned.) And his 1942 novel Love’s Lovely Counterfeit, about a town full of gangsters and crooked politicians, seems as though it would have been a more appropriate vehicle for James Cagney or George Raft 10 or 15 years earlier. So The Postman Always Rings Twice was a natural choice for MGM, a powerhouse of a studio that churned out high-quality product week in, week out. The film works as well as it does because of the presence of Lana Turner, who in 1946 may have been the sexiest woman in Hollywood. 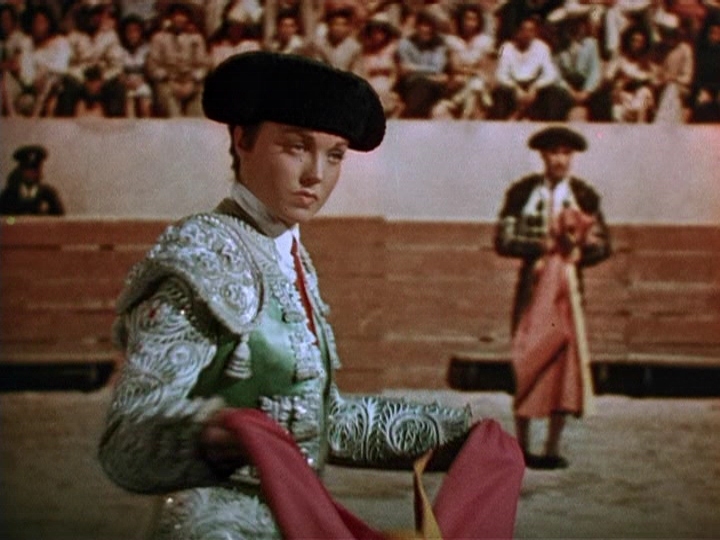 John Garfield turns in a credible performance, but he and Turner never quite click. So much of the film is spent setting up and knocking down plot points that their relationship seems almost like an afterthought. A better adaptation of Cain’s novel is an unauthorized one, Luchino Visconti’s Ossessione (1943). (Cain’s publishers sued for copyright infringement, and kept the film off American movie screens until 1976.) Both the grimy working class milieu and desperate, sweaty love affair are better handled in Visconti’s film. The American version is just too sterile. Posted in 1946, May 1946 and tagged Alan Reed, Audrey Totter, Carey Wilson, Cecil Kellaway, Film Noir, George Bassman, George White, Harry Ruskin, Hume Cronyn, James M. Cain, Jeff York, Joel Friedkin, John Garfield, Lana Turner, Leon Ames, Metro-Goldwyn-Mayer, Niven Busch, Sidney Wagner, Tay Garnett, The Postman Always Rings Twice, Tom Dillon, Wally Cassell. Bookmark the permalink.